She is recognized, by scholarly consent, to be one of Utah’s and Mormondom’s most eminent historians. Her total honesty, unwavering courage, and perceptive interpretation of fact set more stringent standards of scholarship for her fellow historians to emulate. 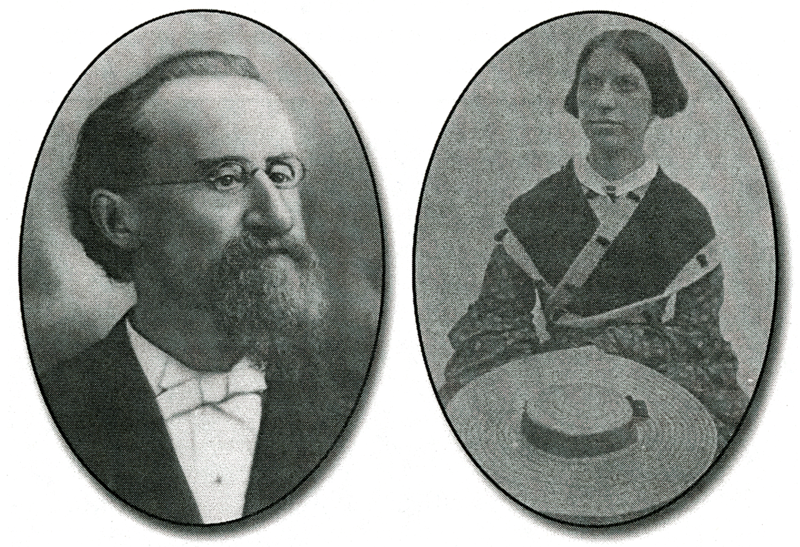 Dr. Obert C. and Grace Tanner had been lifelong friends of Mrs. Brooks and it was their wish to perpetuate her name through this lecture series. Dixie State College and the Brooks family express their thanks to the Tanner Family. 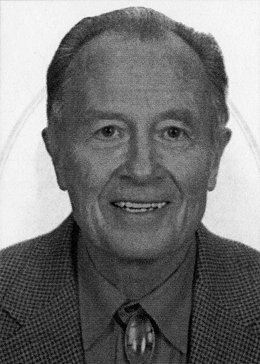 Lowell C. “Ben” Bennion received his Ph.D. in Geography from Syracuse University. He taught for five years at Indiana University and thirty years at Humboldt State University before retiring to his hometown of Salt Lake City in the year 2000. He has written several articles related to Mormonism’s geographical dynamics and has coauthored three books — a prize-winning Sanpete Scenes: A Guide to Utah’s Heart (2nd ed., 2004), Traveling the Trinity Highway (3rd printing, 2003), and Polygamy in Lorenzo Snow’s Brigham City: An Architectural Tour (2005). He is currently working on two other books related to “Plural Wives and Tangled Lives: Polygamy’s Place in Mormon Society, 1850-90,” one of which will feature a chapter on Elizabeth Kane’s 1873 sojourn in St. George. Ben gratefully acknowledges the support his research has received from the Charles Redd Center for American West Studies and the former Smith Institute for LDS History at Brigham Young University. Four considerations prompted me to accept Professor Alder’s invitation to present this year’s Juanita Brooks lecture, intimidating as such an honor is. Decades ago at Dixie College, fellow geographer Merrill Ridd and I participated in a lecture series arranged by Charles Peterson, then a history professor at Utah State University. 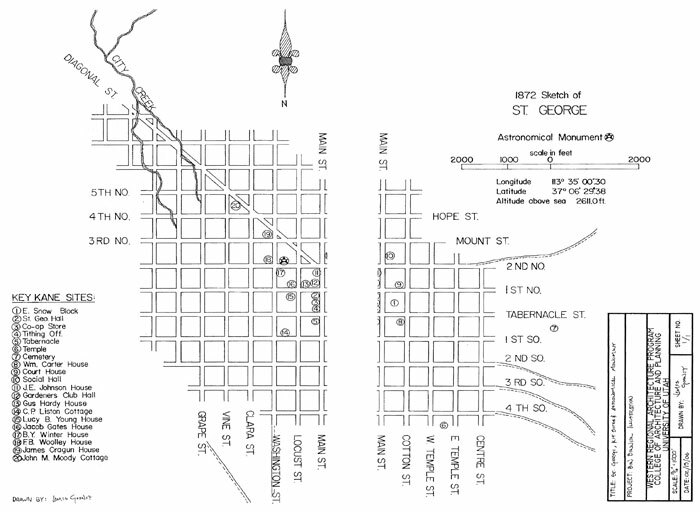 We titled our presentation “Utah’s Dynamic Dixie: Satellite of Salt Lake, Las Vegas, or Los Angeles?”1 Although asked to focus on the post-1940 period, we kept wondering how a once tiny St. George became the center of such a huge hinterland. In seeking answers we discovered the illuminating writings of Juanita Brooks and Karl Larson, who were gracious enough to let two naive geographers ask them questions about this intriguing region. 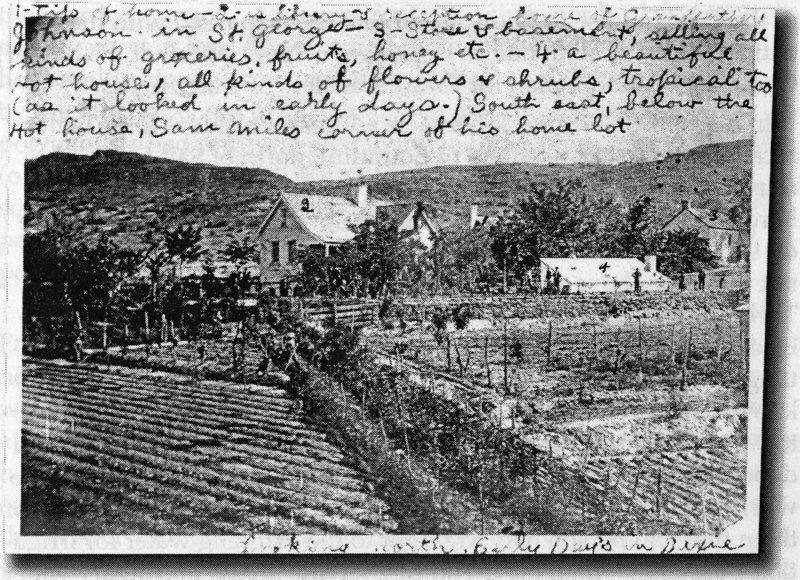 A third motive may have led to the lecture invitation, for Dr. Alder knew I had started writing a book about the Twelve Mormon Homes and families visited by the Thomas L. Kanes in the winter of 1872-73. It took the Kane Company led by Brigham Young twelve days to travel from Salt Lake to St. George. Ironically, Elizabeth Kane’s account of the trip, published a year later, devoted only two pages to the place where they sojourned for two months, hoping the climate would improve the General’s health. Fortunately, she continued her journal while residing in St. George, but it did not appear in print for another 120 years.3 (For both books, now out of print, we are indebted to Obert & Grace Tanner, co-sponsors with the Val Browning Library of this lecture series.) Thanks to Mrs. Kane’s second book, our Twelve Mormon Homes Revisited volume will give more space to Erastus Snow’s “Big House” in St. George than to any of the eleven homes where the Kanes stayed only a night or two. Finally, when Alder’s Dixie call came, colleagues and I had all-but-finished a somewhat similar project for Lorenzo Snow’s Brigham City. That book maps the extent of polygamy and offers a “tour” of the different kinds of houses built to accommodate plural families.4 We used artist E. S. Glover’s 1875 “Bird’s-eye View of Brigham City” and the “footprints” of the buildings found on later Sanborn Fire Insurance Company maps. Alas, neither Glover nor the Sanborn Company ever reached remote St. George. Happily, I learned through Clif Spendlove, a winter resident of this city, that the Museum of Church History and Art had agreed to produce a model of Erastus Snow’s town for the St. George Temple Visitors Center. It resembles on a smaller scale the splendid exhibit of central Salt Lake, as of 1870, that is housed in the LDS Church’s museum. The staff allowed me to scan their research files and, unwittingly, helped me decide how to structure this lecture.5 Their St. George model, combined with the 1877/1904 plat maps drafted by the Macfarlanes and the well-known “Pioneer Map,” could serve as a substitute for the Brigham City visuals. 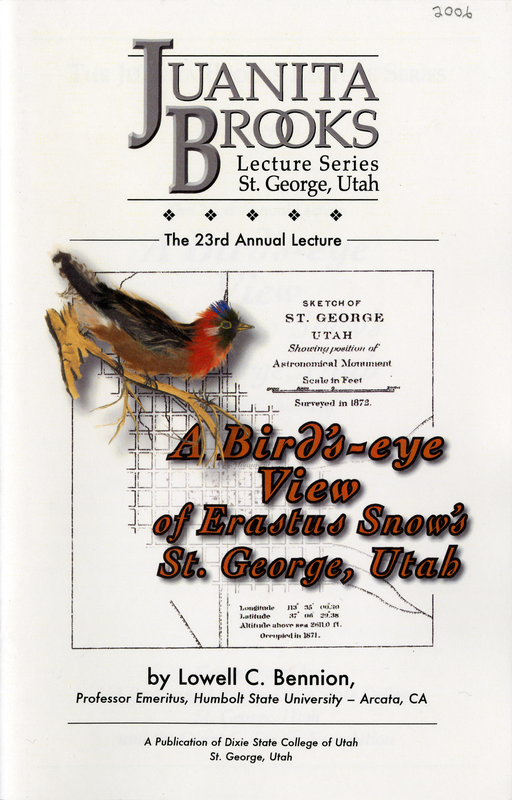 Thus my first scholarly encounter with St. George, John Bennion’s connection with Dixie, and my recent study of Salt Lake’s two “Snowy” satellites made it impossible for me to decline the Brooks Lecture invitation. Any bird’s-eye survey depends first of all on the type of bird viewing the scene. Were we to select a hawk hovering over Black Ridge or Sugar Loaf, we would undoubtedly get a different view of the town than if we picked a blackbird perched in a cottonwood tree. During the Kanes’ stay in St. George there were so many birds flying about that their young son Evan said, “the cottonwoods seem to have budded out in blackbirds.”6 Would we want to consider a low-flying quail for a ground-level look? Or should we adopt the Snow to their daughter Florence7 for an outsider’s take on St. George’s townscape? Variations in views should remind us of a basic geographical axiom implicit in the subtitle of A History of Washington County prepared by Professors Alder and Brooks — From Isolation to Destination8 or, to alter it slightly, “From Desolate Isolation to Balmy Destination.” The climate and topography of this area have changed little over the past 150 years, but Utahns’ perceptions of Dixie have changed greatly, due in part, of course, to the new amenity called air-conditioning. Even in the 19th century, as Paul Reeve’s dissertation so effectively demonstrates9, Paiutes, Mormons, and Miners viewed the same territory through contrasting cultural lenses that led to frequent conflicts among them. Thus one could argue that the environment perceived, more than the environment per se, has determined the cultural landscape characteristic of St. George, no matter what the time period. Fig. 3. Based on the “Astronomical Monument” map issued by the U.S. Army in 1872 (and copied by the Utah State Historical Society for the front cover), this map locates many of the sites visited by the Kanes. If we could agree on which kind of bird has the ideal vantage point, we would still have to decide on just when we wanted to view the town during Erastus Snow’s long tenure (1861-88) as the chief leader of the community. One drawback inherent in the “Pioneer Map,” or any such map for that matter, is that it does not capture the dynamic distribution of the Pioneers, even within the city, or the ongoing changes in their built and cultivated environment. No one has described the difficulty of persuading Dixie settlers not to leave the land better than President John Taylor, speaking in this Tabernacle 20 years after the founding of St. George. He expressed sympathy for the repeated efforts of the corpulent but energetic Apostle George A. Smith to bring settlers to the Southern Utah Mission. Ten years before Taylor’s talk, Smith offered his own assessment of St. George (along with an eagle’s-eye view of its setting), one that contained no hint of the discouragement he had experienced in getting Dixie settlers to stay. For closer bird’s-eye views of St. George, I have drawn from many sources but mainly from two that reflect my bifocal lenses and interests as a historical geographer. The first is Elizabeth Kane’s A Gentile Account, one that would probably impress Juanita Brooks because it’s so perceptive and written by an outsider whose “particular interests were the geography and geology, and, of course, Mormons and Mormonism, especially the lives and roles of women.”12 The second source I uncovered through the aid of my older host, Elder Alder. He directed me to St. George’s City Council Minutes first for 1862-72 and then for 1877-88. They may seem like a mundane and terribly tedious record to read, but they paint a quail’s-eye picture of the place for all but five years of Erastus Snow’s reign. The five-year gap in extant Minutes I filled in with James G. Bleak’s indispensable Annals of the Southern Utah Mission. Unlike Box Elder County, centered on Lorenzo Snow’s Brigham City, Dixie had an official historian, a meticulous Englishman who somehow kept track of almost every happening even while clerking for several organizations, serving in a bishopric or stake presidency, and directing three households. An old man joined us…as we passed a cottage which, but for its wide vine shaded piazza [porch] would have looked thoroughly English with its whitewashed rough-stone walls and deepset casement windows…On the opposite side of the road stood a cottage built Swiss fashion with a high overhanging piazza running round the second story, so that we could see the family gathered there in spite of the high hedge of mesquit[e] round the lot. Since the St. George census-taker in 1870 counted just four Alabama-born residents, only one of whom — at age 48 — could be considered old, we can safely conclude that the man with whom they chatted was John M. Moody, a farmer and one-time member of the City Council. His “little fertile oasis,” as Mrs. Kane would have termed it, included a second home for two of his three wives and all of his ten at-home children, judging by the census listing of two separate households. 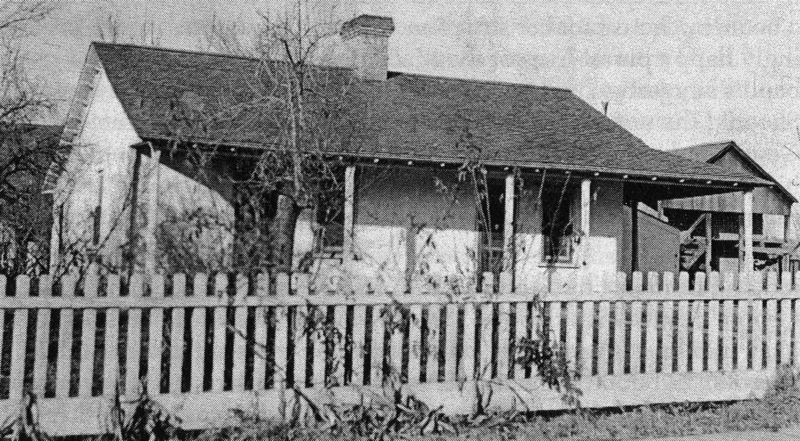 Just a block or so away from the Moody place the Kanes might have spotted a Southern-style house “pre-framed” in Pine Valley by James Cragun, who took a slower and longer road to Dixie in the summer of 1863. The autobiography of his daughter, Martha C. Cox, contains a brief but suggestive description of the house built by her Virginia-rooted father from southern Indiana. On a weekday morning, the Kanes started out for “the top of the [Black Bench] mesa” but were soon stopped by Mrs. Lucy Young, Brigham’s St. George wife (or “Bigham Squaw,” as the Paiutes called her), who insisted on showing the boys how she watered her yard. Elizabeth describes the process so well that one can almost visualize it without the aid of a photograph. At this time of year there is no limit to the time allowed for watering, but later, when the crops start, each lot has but three hours in the twenty four assigned to it … She has three, one of which is allowed to remain uncultivated, so that she has nine hours water time for the two lots … Her garden is the best looking in the village … From the acequia in the street, which runs very rapidly there are two troughs made of boards which traverse her lots…. At intervals there are ‘gates’ in the sides of the troughs … acting as valves which are kept closed by the pressure of the water. Susa Young Gates, in the biography she wrote of her mother nearly 60 years after the Kanes’ visit, makes the house sound a bit bigger than the cottage described by Elizabeth. In Susa’s eyes, it was built “in old New England style with a wide front porch, long windows in the front opening right onto the porch, a parlor, dining room, roomy pantry and kitchen, with back porch, one down-stairs bedroom, and three upstairs.” However, the home had one serious drawback: “the house cellar was apt to fill up with water, and the foundations became rotten very soon. Careless building it was,” at least in the eyes of the daughter of a master craftsman.18 Certainly the home was too small to accommodate any of the sizable groups that Brother Brigham brought with him whenever he wintered in St. George. The year after the Kanes’ departure he bought and then greatly enlarged another house still known as his Winter Home. In spite of the presence of a fair number of Scots, including Elizabeth’s good friends, the so-called “McDiarmids,” the town’s leading horticulturists were New Yorkers. Club President Joseph E. Johnson had moved to Dixie on his own initiative from an impressive Spring Lake Villa in Utah Valley because of his interest in raising more exotic plants than the northern climate allowed. The Gardeners’ Club may have included one or two Swiss as well as some Scots, for one square on the southwest side of town was known as the “Swiss Block,” located in the small LDS Second or Swiss Ward — a section the Kanes may not have seen. However, one day they did drive out to see Santa Clara. “The village lay on either side of a broad brown road, the water gurgling briskly in the ‘ceqs’, (acequias), and each little house standing apart in its garden, half-buried in foliage. Altogether, the place had such a European look that I was not surprised to learn that the inhabitants are Swiss.” Elizabeth’s photographic eye caught sight of a stone house “perched high up on an isolated hill, and had rude stone terraces on which a vineyard was planted. The ground floor seemed to be tenanted by cattle, who gazed at us from the doorway as if they owned the place…. Below this house stretched vineyards, fields where the sorghum stubble stood, and cotton fields where my children eagerly picked some bolls that had been forgotten.”20 Given the intensity of Dixie’s largely subsistence agriculture, especially in the towns themselves, it should not surprise us that Santa Clara, St. George, and Washington were swarming with bees, birds, flies, and even mice, rats, and cats. As early as the winter of 1870-71, Brigham Young took full advantage of Erastus Snow’s willingness to share his “Big House” with the President’s guests. One of them, Colonel Robert T. Burton21, was assigned the responsibility of taking charge of all these boarders until the party’s departure a month later, presumably to relieve Elder Snow’s four busy wives of the burden. 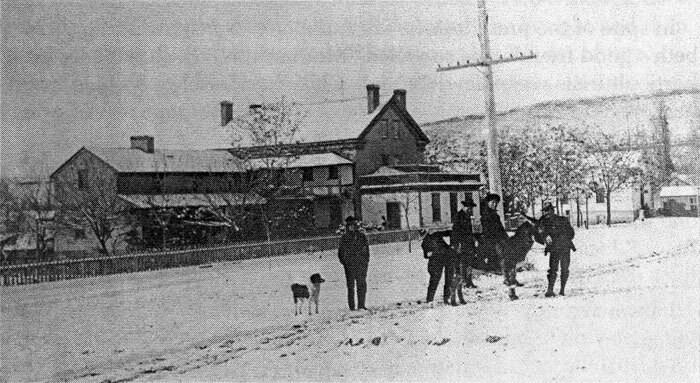 When the “Kane Company” arrived two years later, the Big House had already become the town’s leading “Boarding House” — later officially licensed as the “St. George House.” All but one of Snow’s wives, Elizabeth by name, had moved out of this house, where the Kanes occupied a comfortable suite on the first floor, into separate and smaller but more private homes located on the same block. Before leaving, an embarrassed Mrs. Kane realized Artimesia was not the one who had extended the invitation. So “After lunch I went to see the right Mrs. [Minerva] Snow. Her house stands in the same garden-vineyard as our Mrs. [third wife Elizabeth] Snow’s and has a wide and lofty trellised arbour at the back. The house commands the same view as that of the wife I visited this morning, and is about the same size, and equally comfortably furnished….”22 Keeping the identity of Erastus Snow’s wives straight proved difficult for Elizabeth Kane because he never specified which wife when he said “my wife,” and she seldom, if ever, saw all four together. Even though the builders moved ahead and “laid the foundations of a temple,” apparently the rains of the following winter had “undermined them” enough that the Saints’ pragmatic leader had second thoughts about the site. Briefly at least, while the Kanes were with him, Brigham Young did indeed consider alternative locations. Accompanied by Major General Kane and other members of his party, he visited the same “Black Bench” from where men were hauling volcanic rock to pound into the boggy ground for the base of the temple. But there on the Black Ridge “the want of water setsthem against it” as a site, wrote Mrs. Kane. She and her husband thought the people favored “building [the temple] at the head of this [Main] street, where there is a sort of terrace below the Sugar Loaf Bluff. They call it Mt. Hope,” though she would have renamed it “Mount Despair.” Presumably that was where, ten years earlier, Young himself had expressed a desire “to obtain the mound North of St. George with a few acres around it, possibly with a temple site in mind. Then in 1864 Elder Snow obtained from the City Council for $100 permission to use “the Water rising on the Little Bench near the head of Main Street….” But they attached a key restriction — “Provided that so long as needed for domestic use the said waters shall be permitted to flow down the East side of Main Street at least three hours each morning.”24 In President Young’s eyes, perhaps that terrace on the steep slope of Mount Hope was too narrow or too limited by its sandstone base to be a suitable place for the temple. 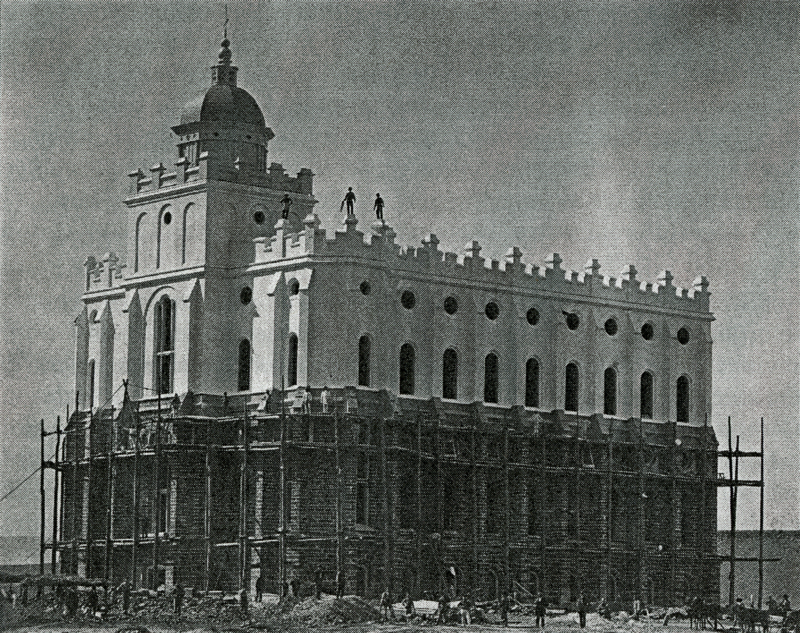 Although the President clearly patterned the St. George Temple after the “modern Gothick” (Parry’s term) style of the larger Salt Lake Temple, he decided against siting it in the already built-up center of town, on the precarious slope of Mt. Hope, or atop the arid Black Ridge. In Logan and Manti he also selected temple sites outside the then inhabited city. But in each of those cases he located them on what his successor John Taylor termed “a very imposing position” above the settlement.27 The Logan/Manti sites and that of the centrally placed Salt Lake Temple make the St. George Temple’s position seem incongruous. However, the hill above Manti took as much time and effort to prepare as the slightly elevated but swampy mound south of this town. Perhaps Young would have preferred a more central or commanding site for Dixie’s temple, but by then, if ever, Mormon cosmology did not require a specific kind of space for a sacred edifice. As an experienced builder, the pragmatic President figured out a way to make an alkaline mound located outside of town work remarkably well. By April 1862, St. George had a fully functioning City Council consisting of a mayor, two aldermen, two councilors (later four) and several other officers ranging from recorder to sexton. The Council, elected every two years, met at least twice a month, usually on Saturdays, providing enough members showed up to form a Quorum. They functioned in formal fashion, voting on all bills or issues brought before the group and often forming committees to investigate matters that required further study. For convenience sake, one could summarize the Council’s concerns and actions under the names of the three-man Standing Committees created at an early date: Claims & Appropriations, Ordinances, Drainage & Streets, Public Grounds & Improvements, Sanitary Affairs, Water Works and Water Rights. The only catch is that the first two were tied to most Council actions, which required not only funding but often an ordinance. As early as 1868, the Ordinances Committee “was instructed to make and present an Ordinance naming the Streets of the City.” If they acted, only the streets running east and west were named in conventional fashion, from 4th North to 4th South on either side of Tabernacle Street (see “1872 Sketch of St. George”). Not until 1877, when the City finally published a map surveyed by John M. Macfarlane, were all “the streets running north-south” on either side of Main Street and the “short streets on or near Mount Hope” officially named. By then, the City extended from Bluff on the west to Ridge (now 10th East) on the east with most of the streets in between given the names of plants, rivers, or trees. I doubt that any Dixie person still living remember the names Grape, Vine, Clara, Washington, Locust, Cotton, West Temple, East Temple, Centre Ave., Maple, Mulberry, Elm, Walnut, Chestnut, Magnolia, Palm, Rio Virgen Ave., Orange, Olive.”31 By 1904, those folksy names had yielded to the formal East-West names. The Drains Committee’s first assignment was “to drain [the] west part of the City” with two main drains. Residents could, if they wished, locate sub-ditches at their own expense.32 Why drain the west — rather than the eastside? The west part of town had to contend with the irregular flow of City Creek, a task compounded by occasional floods and the effects of upstream water-users like the distillery, two mills, and a tannery. In time, the work of the Drains Committee became inseparably connected with the annual or oftener cleaning of ditches and the grading and so-called “turnpiking” of streets. Nowhere did that work prove more challenging than along Diagonal Street and at its convergence with Main Street — the center of the city’s tiny business district. After straightening out Diagonal Street and adjusting property lines at considerable expense, they hired a crew to build a deep rock-lined irrigation ditch along the northeast side of that singular street cutting across the St. George grid. 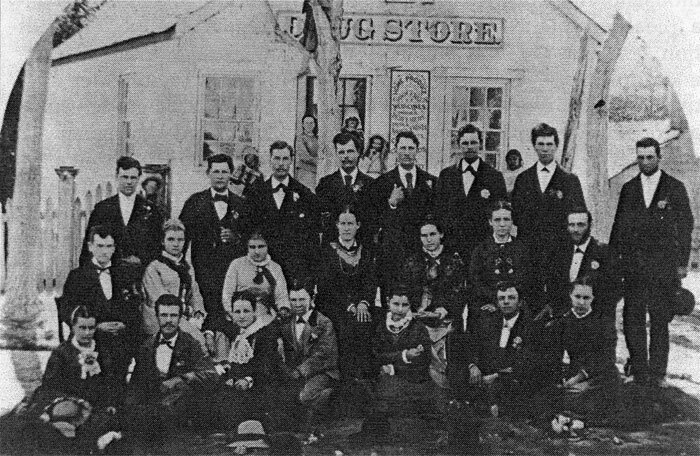 As early as 1867, the City took a census of its married men and discovered that 69 of its 172 married men — or 40 percent — were polygamists.43 Unfortunately no count was made of the status of the married women. Assuming just two wives per husband, one might expect at least 80 percent of them to have lived in a plural household. However, examination of the population recorded by the federal census of 1870 indicates that quite a number of the polygamists had only one wife living in St. George. The other wife (or wives) resided in a different Dixie town, Salt Lake, Provo, or some distant place such as Panguitch. Thus perhaps only about 60 percent of the city’s married women in 1867 would have claimed a polygamist as a husband. Judging by careful calculations based on the 1870 census and LDS Family Group Records44, those percentages dropped a bit during the next three years. Then only about 60 of the city’s 200 households were headed by polygamists or their wives, but they accounted for at least 45 percent of the total population. Some plural families may have moved elsewhere before the census was taken, though others who arrived after 1870 to work on the temple in effect replaced them. And younger men like Henry Eyring or Charles Walker waited until the 1870s or even later to multiply their families.45 The census-taker failed to count William G. Perkins (and his two wives), who gave both of the Kanes a patriarchal blessing before their departure. For whatever reasons, he probably missed other families, too, monogamous as well as polygamous. 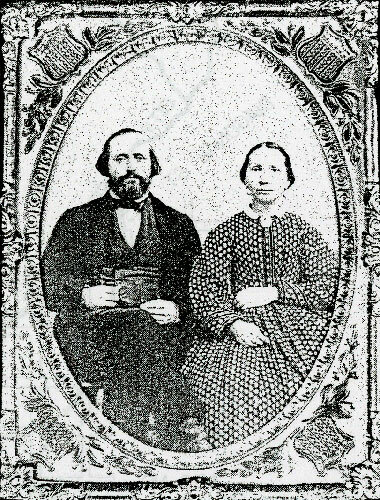 Whatever the exact figures, Elizabeth Kane could not have complained about a scarcity of “plural” people to “interview.” After all, Brother Brigham’s entire entourage, with the exception of his servants, consisted of persons living the Celestial Order of Marriage, all of whom she mentions from time to time in her travel diaries. “Mrs. A.,” for instance, was the President’s so-called “favorite wife” Amelia Folsom, who, without any children of her own, was free to accompany him on many of his trips. 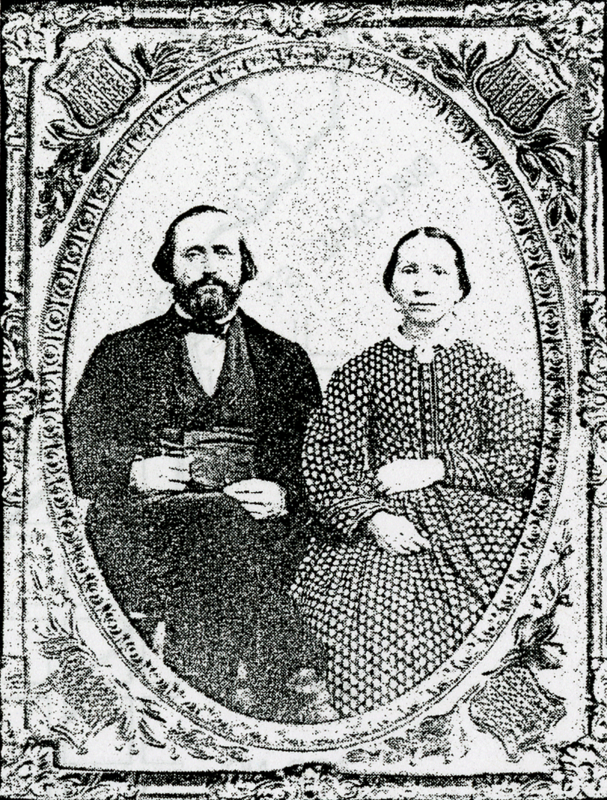 Brigham’s brother Lorenzo brought his Welsh wife “Mrs. Jane;” and Bishop A. Milton Mussercame with his “Silent Woman.” Salt Lake’s Bishop Sheets and William C. Staines, the Kanes’ popular “Chief of Staff,” left their wives at home but certainly could have served as male informants for Elizabeth. St. George’s singing blacksmith, David H. Cannon, or its choirmaster, John M. Macfarlane, each of whom she mentions more than once, presumably also would have responded to her questions. But she clearly felt more comfortable with the women and spoke intimately with several of them about various facets of plural living. They are the ones whose stories I shall selectively try to capsulate. Mrs. Kane sympathized with the Johns’ hard life. But she also wondered why so many such families failed to follow the Mormon theory that polygamy was “better for the physical health of mothers and infants” if the wives lived apart from their husbands “during pregnancy and lactation.” Wanting to know “why some one had not counselled with Brother Johns for Louisa’s benefit,” Mrs. Kane went to see Mrs. Lange, “a spectacled woman of sixty or so; stout, shrewd and hard-headed as Susan Anthony herself.” She found not one but two Mrs. Langes, both examining “their joint husband’s clothes … to put them in order before he went on a mission.”47 Busy as they were, Elizabeth got no answer to the question that concerned her so. As of the 1870 census, Jacob Gates, already a prominent civic and church leader, lived in a modest house with his three wives — Mary Minerva (only 56 years old), Emma (39), and Mary Ware (26) — and six children (15 to 1), just a block away from his brother-in-law’s Big House. The strained relationship of the two younger wives and the eccentric and childless first wife prompted Jacob to separate the three. For the younger Mary, he built a two-story adobe in the Dixie hamlet of Bellevue (renamed Pintura), where the Kanes stayed on their way to and from St. George. Emma could not abide living with the older Mary, for whom he had to find a separate place. In a letter written to Snow in 1885 in response to the apostle’s chiding him for not taking better care of this burdensome wife, Gates, then nearly 75 and residing in Provo, vented his pent-up feelings. One cannot help but wonder what Elizabeth Kane would have thought of St. George and Mormon polygamy could she have returned to Utah at the time of Erastus Snow’s passing, which occurred while he was on the “Underground” about two years after the decade of federal raids had begun. He, like a surprising number of his fellow Dixie polygamists, succeeded in escaping imprisonment. Often they received timely telegraphs from the mining town of Silver Reef warning them that deputy marshals were headed for St. George. In spite of the city’s large number of polygamists, the marshals failed more often than not to arrest them.56 Of course, many of the plural families had slipped over the border into Nevada or Arizona or moved all the way to Chihuahua, Mexico, sometimes with the encouragement of Elder Snow. 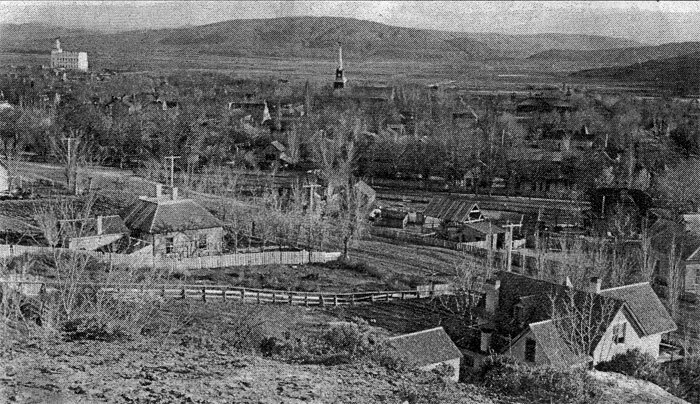 Ironically, at the same time a few prominent northern polygamists like Benjamin F. Johnson and Apostle Wilford Woodruff found temporary refuge in Utah’s isolated first temple town — in the temple itself, in Brigham Young’s winter home, or on William Atkin’s farm along the Rio Virgin. The general disruption and dispersal of St. George’s plural families must have changed the city so much that Elizabeth Kane would have felt disoriented had she returned in the late 1880s. Even more than in 1872-73, she probably would have underscored the independence of Mormon women. “So many of them seem to have the entire management, not only of their families, but of their households and even outside business affairs, as if they were widows.”57 By 1888, many of the plural spouses Mrs. Kane had known, including Erastus Snow’s three surviving wives, had become actual widows. Even those women who had not lost their husbands relied more than ever on their own resources and sister-wives. Some of them, as clearly evident in the case of Isaiah Cox’s first three wives, became increasingly estranged from their spouse.58 While “lavishing labor for too trifling a return,”59 the self-reliance and resilience of that first generation of St. George Saints enabled the city to survive. Only one advantage did they have in the mind of President John Taylor — “no one will want to steal away your place from you; will they?” His Tabernacle audience laughed, undoubtedly encouraged by his recognition and appreciation of their untiring efforts. Let me conclude with his tribute to them. This lecture was subsequently published in the Utah Historical Quarterly: 45 (Spring 1979): 311-27. For a full account of his seasonal sojourns in Dixie, see the Bennion Family History (Salt Lake City: Bennion Family Association, 1990), Vol. IV, Chap. 4. Compare the new edition of Elizabeth W. Kane’s Twelve Mormon Homes (Salt Lake City: University of Utah Tanner Trust Fund, 1975) with A Gentile Account of Life in Utah’s Dixie, 1872-73 (Salt Lake City, University of Utah Tanner Trust Fund, 1995), hereafter cited as A Gentile Account. Polygamy in Lorenzo Snow’s Brigham City: An Architectural Tour was published in 2005 by the University of Utah as Publication No. 10 of the Western Regional Architecture Program, College of Architecture and Planning. Professor Tom Carter and History Graduate Student Alan L. Morrell were my co-authors. Architect Jack Brady and five graduate students of the College of Architecture and Planning served as indispensable partners in the project. Jennifer L. Lund and Emily Utt are the two women who showed us the St. George Model cast by artist Gale Hammond and who facilitated our research by sharing with us their own. Emily undertook the painstaking task of trying to locate all of the homes and other buildings in St. George as of 1886. J. Clifton Spendlove, co-author with Lund of “A Guide to Salt Lake City in 1870,” an unpublished manuscript completed in September 1997 for the Museum of Church History and Art, is the one who alerted me to the St. George model. A Gentile Account, p. 5. The Snows sent the card on Oct. 28, 1886; it’s found in the Franklin B. Woolley-Erastus Snow Family Collection, located in BYU’s HBLL Special Collections, MSS P-60, Box 2, Fd. 7. A 2nd edition of this fine history, published by the Zion National Park Natural History Association, will appear later this year. W. Paul Reeve, “Mormons, Miners, and Southern Paiutes: Making Space on the Nineteenth-Century Western Frontier, Ph.D. dissertation, Dept. of History, University of Utah, May 2002. The University of Illinois Press is scheduled to publish the thesis in revised form later this year. See also Nancy Ann Sessions Rohde, “Environmental Images of Utah’s Dixie, 1847-1880,” M.S. Thesis, Dept. of Geography, University of Utah, June 1884. Journal of Discourses, Vol. 23, Nov. 9, 1881. Taken from George A. Smith’s Jan. 5, 1871, letter to John Jacques, one of Brigham Young’s clerks in Salt Lake, and copied in the James G. Bleak Diaries, MS 1691, BYU, HBLL Special Collections, Box 1, Fd. 1, under that date. Taken from Mary Karen Bowen Solomon’s “Profile of Elizabeth Kane” in A Gentile Account, p. xviii. A Gentile Account, pp. 4-5, 22, 32. “Autobiography of Martha Cragun Cox,” LDS Church Archives, MS 1661, pp. 84-85. A Gentile Account, pp. 96-98. Susa Young Gates, “Lucy Bigelow Young,” LDS Church Archives, MS 13791, p. 75. Susa wrote the biography in 1930-31; her descendant G. Homer Durham copied it for his children in 1969. A Gentile Account, pp. 114-16. See the Robert Taylor Burton Diaries 1856-1907, LDS Church Archives, for his brief but informative day-by-day account of the party’s stay in St. George, Nov. 1-Dec. 18, 1870. See Parry’s March 21, 1874, report as transcribed in the James G. Bleak Diaries, Box 1, Fd. 1, MS 1691, located in BYU’s HBLL Special Collections. For Young and Snow’s early interest in the Mount Hope site see the St. George City Council Minutes (hereafter abbreviated CCM), Mar. 19, 1863, and July 23, 1864. 24 A Gentile Account, p. 19. James G. Bleak Diaries, Feb. 15, 1873. Journal of Discourses, Vol. 23, Nov. 9, 1881, p. 23. Compare CCM, Nov. 24, 1869, and May 17, 1884. Ibid., Aug. 31 and Sept. 1, 1863; Mar. 6 and 19, 1877. A Gentile Account, p. 46; Isaiah M. Coombs Journal, LDS Church Archives, MS 2737, June 5, 1882. CCM, Aug. 15, 1868; Aug. 4, 1877. Ibid., Dec. 6, 1882, and Aug. 22, 1883. Ibid., Dec. 6 and 9, 1870. Ibid., Mar. 8, 1878; Mar. 9, 1880; May 19, 1877; Feb. 8, 1879. Ibid., May 4, 1878, record the “Measurement of City Waters” for that spring. Journal of Discourses, Vol. 23, Nov. 9, 1881, p. 12. Read the CCM, May 21, 1881, and Feb. 4, 1882, for just one instance of such a debate. A Gentile Account, p. 177. See James G. Bleak, Annals of the Southern Utah Mission, Book A, Mar. 8, 1867. See Larry M. Logue’s invaluable study, A Sermon in the Desert (Urbana and Chicago: University of Illinois Press, 1988). Until this lecture my own writing about polygamy in Dixie focused on 1880. See Lowell C. Bennion, “The Incidence of Mormon Polygamy in 1880: ‘Dixie’ vs. Davis Stake,” Journal of Mormon History, 11 (1984): 22-47. Walker’s wait was not by choice. As early as 1865, at age 32, he asked Brigham Young’s permission to take a second wife, but not until 1877, after beseeching “the Lord many times on this subject,” did he finally succeed. See A. Karl Larson and Katharine Miles Larson, eds., Diary of Charles Lowell Walker (Logan: Utah State University Press, 1980), Vol. I, pp. 250 and 444-45. A Gentile Account, pp. 62-66. 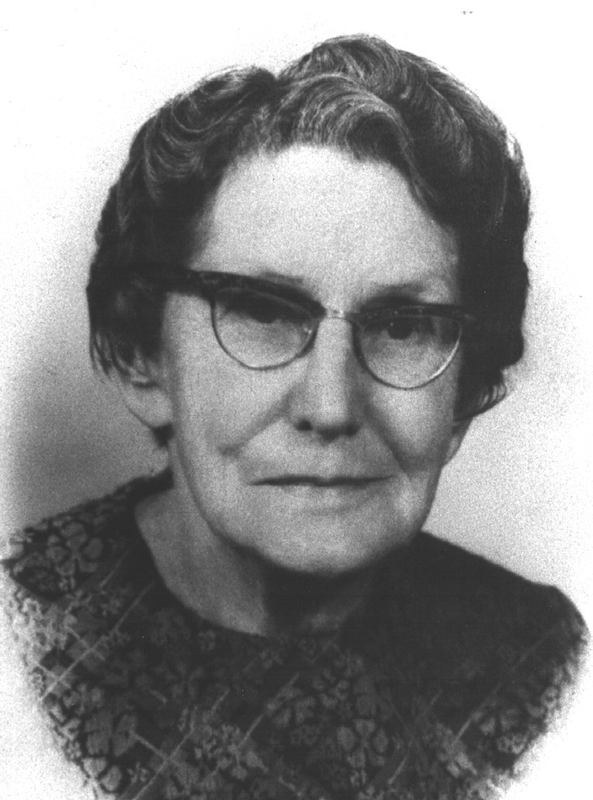 Prior to the Kanes’ visit, both James W. Nixon and Eli Whipple operated sawmills — the former near Pioche, the latter in Pine Valley — but neither of them had a wife by then who had borne nearly as many children as Elizabeth’s Mrs. Johns. Ibid., pp. 67-68. One would assume these two women were married to either John or William Lang. But neither of these two men had a wife anywhere near age 60, and both of them were from England, not Massachusetts, as indicated by Mrs. Kane in describing her “Mrs. Lange’s” husband. Ibid., pp. 68-69. Dan Seegmiller was the brother-in-law and nextdoor neighbor of the Isle of Jersey convert, whom Elizabeth identified as “wife to that tinman whose house stands at the foot of Mount Hope, half turned away from the street” (Ibid., p. 51). Letter from Jacob Gates to Erastus Snow, 15 May 1885, in the Jacob Gates Collection, LDS Church Archives. Alan L. Morrell treats the Gates family in his essay on “Bellevue: Gateway to St. George and the Gates Family,” forthcoming in Twelve Mormon Homes Revisited. A Gentile Account, pp. 118, 169-70. For an inside view of the Raids for a single year, see the so-called “Anonymous 1888 St. George Diary,” actually written by John L. Smith and found in BYU’s HBLL Special Collections. A Gentile Account, p. 39. Lavina Fielding Anderson, “A ‘Salt of the Earth’ Lady: Martha Cragun Cox,” Donald Q. Cannon and David J. Whittaker, eds., Supporting Saints: Life Stories of Nineteenth-Century Mormons (Provo: Religious Studies Center, BYU, 1985), Chap. 5, especially pp. 122-25. A Gentile Account, p. 89. Journal of Discourses, Vol. 23, Nov. 9, 1881, pp. 13-16.